Russian Academy of Sciences, Far Eastern Branch, Pacific Oceanological Institute, Vladivostok, Russia “Opening the Arctic”, Washington, Nov.30th-Dec.2nd, 2010. What do we know about methane potential of the ESAS? Is there a mechanism responsible for transformation of methane potential to modern methane source? What are triggers forcing non-gradual modeof methane emission from the seabed? 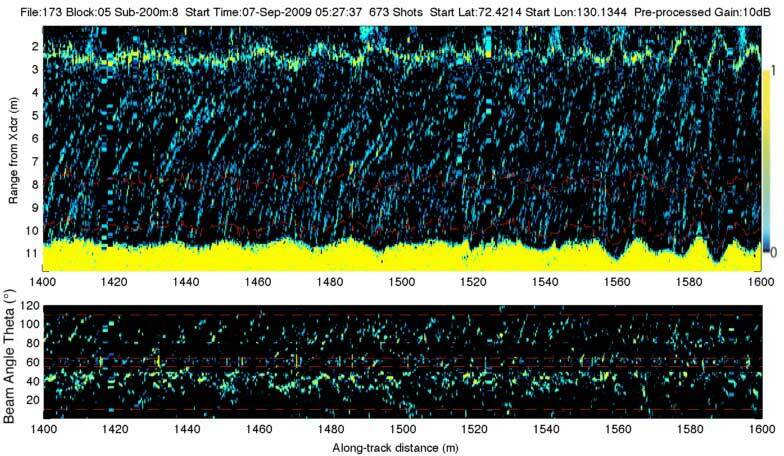 Is there a plausible mechanism, which could determine massive and abrupt methane releases? Why is the ESAS unique in its ability to accommodate huge methane potential? ~75% is shallower than 50 m (mean depth of the continental shelf is 130 m);this provides very short conduit for methane to escape to the atmosphere with almost no oxidation. The highest rates of carbon rain to the bottom provides required amount of organic carbon to be buried in the seabed; Annual sediment accumulation is about 10×10 ^12 g C yr-^1, which approximately equals the amount of sediment accumulated over the entire pelagic zone of the World Ocean. Upward moving geofluids provide transport of hydrocarbons to the areas of gas hydrate stability zone (GHSZ). More potential for abrupt releases: Long-lasting permafrost impermeability determines huge potential of postponed emissions (like a pressure-cooker keeps all the steam inside till you release). Hydrates are found here C org in sediments is highest. What is known about mechanisms of permafrost destabilization associated with formation of gas migration pathways? 1) Natural process of permafrost equilibration with its warmer environment determines talik formation (gradual process) the process is ongoing faster in the fault zones. 2) Natural process of tectonic and seismic activity in the region (non-gradual process) causes permafrost breaks; the process is occurring wherever such events take place. How far has permafrost destabilization gone by now? Modeling resultsAreas of taliks (up to 5%)suggest that area ofpredicted taliks overthe ESAS composes3-5% of the totalarea (Romanovskii etal., 2005). 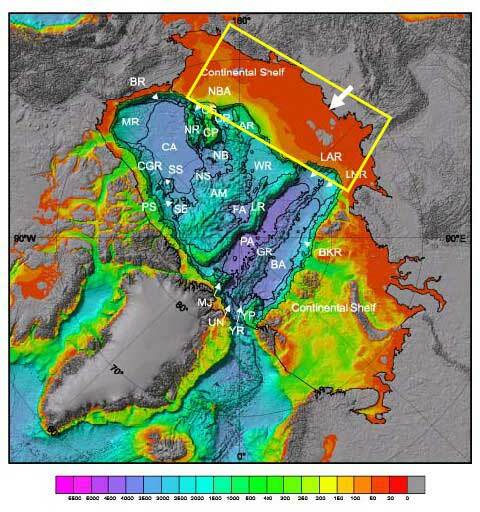 Observationaldata suggest >80%of the ESAS seafloor serves as asource of methaneto the watercolumn (Shakhova etal., 2010). Fig 1. Increase in river runoff to the ESAS is significantly 2002г. Расходр.Лены 2500м3/с noticeable in winter. Owning to it,propagation of warm fresh waters is increasing and occurs laterally and top-down. Fig 2. 2007г. Расход р.Лены 5300м3/сcauses further warming of the sub-sea permafrost in shallower part of the ESAS. Flaw polynyas (open sea water) start their formation in November,when wind breaks apart fast ice and drifting sea ice. Area of the ESAS open water in winter is equal to the total area of Siberian thermokarst lakes open in summer. How much is the methane potential of the ESAS? Interpretation of acoustical data recorded with deployed multi beam sonar allowed moderate quantification of bottom fluxes as high as 44g/m2/d (Leifer et al., in preparation). Prorating these numbers to the areas of 3 hot spots (210×10km2) adds 3.5Gt to annual methane release from the ESAS. This is enough to trigger abrupt climate change (Archer, 2005). Methane emissions from the ESAS depend on occurrence of gas migration pathways, developing through permafrost body (open taliks; permafrost breaks, discontinuity in sediment layers, fault zones, sediment settlement and adjustment etc. 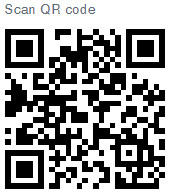 ); this determines non-gradual emission mode. Given that the ESAS is tectonically and seismically active area, seismic events (including endogenous seismicity) might cause abrupt methane releases. Studying the current state of sub-sea permafrost is of critical importance in order to elucidate the time scale of the ongoing process. Given that spatial and temporal variability of methane releases is very high, this underscores importance of establishing monitoring network over the ESAS. Considering the significance of the ESAS methane reservoir and enhancing mechanism of its destabilization, this region should be considered the most potential in terms of possible climate change caused by abrupt release of methane. Recent data suggest the subsea permafrost currently is experiencing significant changes in its thermal regime. For instance, the temperature of subsea permafrost measured in deep boreholes (down to 70 m) 20-km offshore the NW Lena delta was as warm as -1°C, while in the same area terrestrial permafrost had a much lower annual mean temperature (about -12°C) (Rachold et al 2006). At such elevated temperatures, saline permafrost sediments are unfrozen, providing multiple potential CH4 migration pathways. 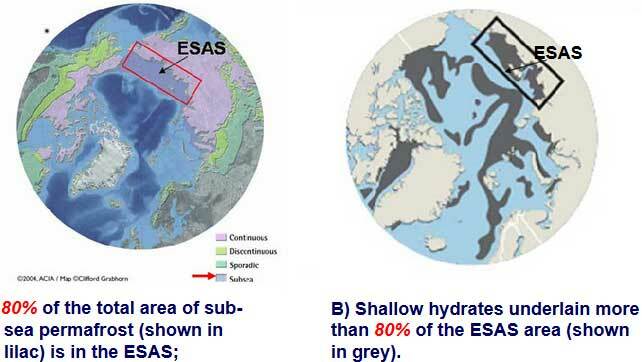 Available data suggest the ESAS subsea permafrost is leaking substantial CH4. 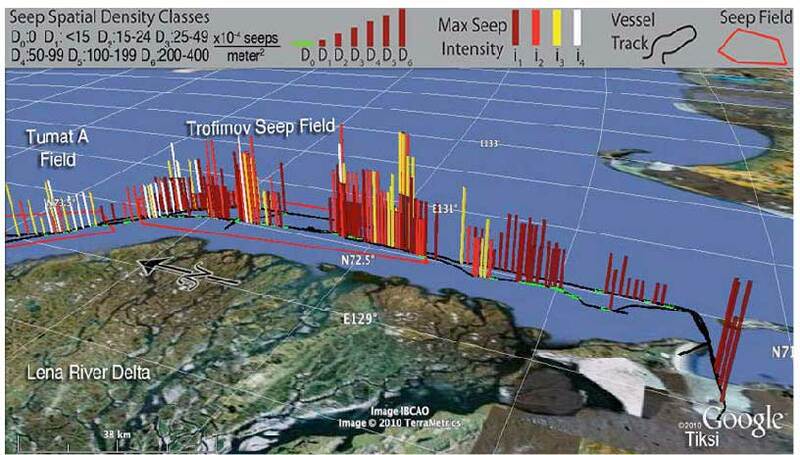 Geophysical data identified numerous gas seeps, mostly in depressions above prominent reflectors, underscoring the likelihood that subsea permafrost is a CH4 source to the overlying water and atmosphere. Numerical models predict permafrost destabilization 5-10 kYr after inundation, depending on the duration of inundation relative to the duration of previous freezing (Soloviev et al 1987), while current predicted open talik (i.e., thawed sediment within permafrost that permit CH¬4 migration) distributions comprise only up to 10% of the ESAS area (Romanovskii et al 2005). Recent observational data go in good agreement with these results as they suggest that ~10% of the ESAS seabed serves as a strong CH¬4 source, composing plume areas and allowing majority of aqueous CH4 (both dissolved and bubbles) to propagate through the water column and escape to the atmosphere. Emissions from plume areas contribute up to 60% of the total annual methane flux from the ESAS. This review paper summarizes current understanding of the transport of organic carbon to, and the fate of organic carbon within, the East Siberian Arctic Shelf (ESAS), and of processes determining carbon dioxide (CO2) and methane (CH4) fluxes from the ESAS to the atmosphere achieved from analyzing the data sets obtained on 20 expeditions performed from 1999 to 2011. This study of the ESAS was aimed at investigating how redistribution of old carbon from degrading terrestrial and sub-sea permafrost and from coastal erosion contributes to the carbon pool of the ESAS, how changes in the hydrological cycle of the surrounding land and alteration of terrestrial carbon cycles affect the hydrological and biogeochemical parameters of shelf water masses, and which factors control CH4 and CO2 emissions from the ESAS. This report describes selected results achieved by a developing international scientific partnership that has been crucial at every stage of the study and will be even more important in the future.